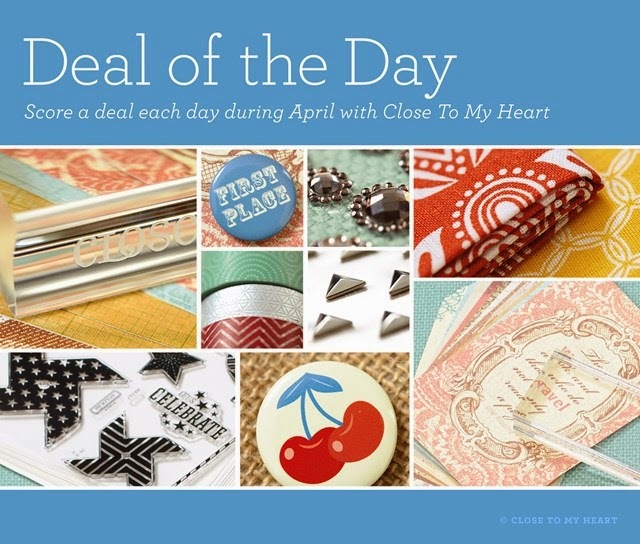 you have the opportunity to score a deal every day with Close To My Heart! What deals are we talking about? Each day during April, while supplies last, we’ll feature a random grab bag filled with current and retired Close To My Heart products available for purchase at a major discount. To grab your bag, simply place any current, full-priced item in your online shopping cart and you will then be eligible to purchase as many grab bags as you wish (while supplies last)! Remember that grab bag tiers will be featured on a random schedule throughout the month, so seize the opportunity to purchase from the grab bag tier you’re interested in when it becomes available because it might not come around again. *Offer valid April 1, 2015 (3:00 pm MDT)–May 1, 2015 (2:59 pm MDT). A given grab bag offer will only be available for 24 hours each day starting at 3:00 pm MDT through my website. Tax and shipping/handling will be charged based on the amount actually paid for the grab bag(s). Amounts paid for grab bag(s) are not eligible for Gathering totals and Hostess Rewards.